We've got hot live photos from this year's New York Auto Show - and nothing is quite as hot as the 2010 VW Golf GTI Mark VI. Everyone's favorite hyper-hatch returns with some spiffy new duds. Where the Mark V GTI was bland and generally a rolling bar of soap, the Mark VI gets enough sharp edges and air-shaping blades to have an 'ole fashioned knife fight with the nearest Honda to give it any guff. The interior and mechanicals remain largely unchanged, with a turbocharged 2.0 Liter thumping out 210HP and 206 Lb-Ft. Transmission choices are either a 6-speed manual or a flappy-paddle DSG. Wolfsburg / St. Tropez, 23 March 2009 - "What else was there in 1976?" calls out "Strietzel", also known as Hans-Joachim Stuck, from the driver's window as he starts up a first generation Golf GTI after more than thirty years. "Whenever a person had a chance to drive a 911, it was a real experience. And then all of a sudden this experience was possible in the GTI too. Clearly on a different level, but affordable for everyone. That was the genius of this car, and it has stayed that way right up to today. The new GTI is a prime example of this." Stuck – one of the true giants of international car racing – works closely with Volkswagen AG. As a representative and driver in car racing, and as an expert in chassis and powertrain tuning in vehicle development, he also put the final touches on the new Golf GTI together with the experts of team "Hackenberg". On the Nürburgring as well, where development chief Dr. Ulrich Hackenberg and Hans-Joachim Stuck competed in parallel, driving Sciroccos for glory and professional experience in last year's 24-hour race. Volkswagen is right at home on the Nürburgring's North Loop. It has always been that way. And the GTI too. Even before sales of the GTI began, it was present on the track of the "Green Hell" before thousands of spectators in 1975 – as a pace car in the prototype stage with a two-barrel carburetor instead of electronic injection. The rest is history. Automotive history. "The 110-PS engine of the GTI", recalls Stuck, "had a willingness to rev that was fun from day one. There had been nothing like it before. That is why the first GTI made such a statement." In the case of the Golf GTI generation VI, the fascination for Stuck began once again with the engine: "It is extremely important that the current GTI, like the last one, should be another turbo. This boosted high-tech engine fits in perfectly with our times. It is more fuel efficient than a large displacement engine, but thanks to the turbocharger it is just as athletic." And that is a key aspect of the Golf GTI tradition too: As early as the second generation, the G60 had an impressive boosted four cylinder engine (118 kW / 160 PS). Later, the era of boosted GTI engines really gained momentum with the fourth gene­ration in the "Golf GTI 132 kW" (the exact name). The technology and times were ready for this approach. A limited edition (3,000 cars) of the 132 kW / 180-PS version was introduced on the GTI's 25th anniversary in 2001. Although there had already been a 150-PS turbo, it did not yet have the aggressive punch of the anniversary version. With the launch of the fifth Golf GTI, an entirely new turbocharged four-cylinder engine was employed, which delivered a power of 147 kW / 200 PS. On the 30th anniversary of the GTI, a 169 kW / 230 PS turbo engine was introduced in the Golf GTI Edition 30. Somewhat later, this new engine also powered the second Pirelli GTI. At exactly 155 kW / 210 PS, in terms of power level the new Golf GTI's TSI engine is positioned between the last production GTI and the 30 Year Edition. Although its performance and displacement data might suggest an advanced development of the 200-PS engine, this was actually a new powerplant of the "EA888" generation of engines whose technical origins were in the 230-PS version. The new GTI successfully addresses these aspects while attending to the property of most interest to GTI buyers – besides the car's appearance – which is its dynamic performance. At a low 1,700 rpm the engine already develops its maximum torque of 280 Newton-meter. And this reserve torque is available as a constant value – exhibiting an ideal plateau in the torque curve that is not really a curve any longer – up to 5,200 rpm. Stuck says: "In practice, this means impressive power in all of life's situations." The maximum power of the sixteen-valve engine with 9.6:1 compression ratio can be tapped over a speed range from 5,300 to 6,200 rpm. The resulting package delivers enormous propulsive force; the car completes its acceleration from 0 to 100 km/h in just 6.9 seconds, and the new Golf GTI handles a 1,000 meter sprint from a standstill in 27.3 seconds. Just as impressive is the engine's elasticity. In fifth gear, the Volkswagen accelerates from 80 to 120 km/h in just 7.5 seconds. Even in sixth gear it only takes 9.5 seconds. Not until 240 km/h is a balance reached between air resistance (cw = 0.324) and power. The tachometer indicates 5,900 rpm at this top speed. The engine and exhaust system of the new Golf GTI are making their appearance with an entirely unique and typical GTI sound. A sound that makes a very sporty impression yet does not irritate car occupants on long tours. On the exterior, the noise level is fully regulated by the newly developed GTI exhaust system. The only visible components of the exhaust system are the pair of chrome tailpipes integrated in the GTI's black diffuser, one on the left and one on the right. Inside, a complex exhaust routing system produces the typical GTI sound. In parallel, it was possible to reduce the weight of the system and its back pressure. And that has a direct positive impact on driving performance and fuel economy. Moreover, a sound generator ensures that the sonorous engine acoustics are perfectly "mixed" in the car's interior as well. "Physical handling limits" always come into play when the safety reserves of a chassis need to be determined. The actual boundaries of the new Golf GTI's physical handling limits are revealed when a driver like Hans-Joachim Stuck is at the wheel. Just a few laps in Hockenheim or on the Nürburgring or a few kilometers in the "Maritime Alps" on the mountain roads above Nice are sufficient for the former Formula-1 driver and endurance race world champion to very analytically describe why the Golf GTI drives at the level of significantly more expensive sports cars and – this is crucial – can also excite the drivers of such extremely expensive sports cars. Stuck: "It becomes immediately apparent just how precisely the GTI tracks steering inputs. And this steering precision is directly reflected in driving quality. The production car chassis offers practically no hint of body roll. The car's quasi lack of roll and pitch results in very safe driving behavior. 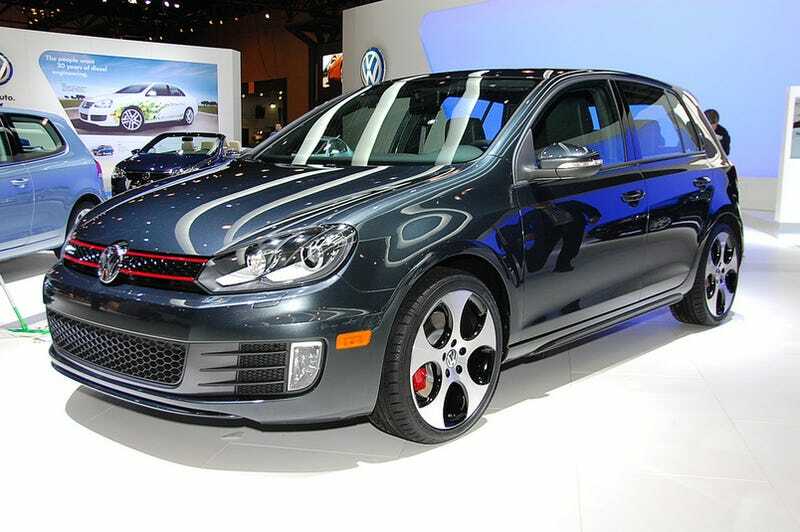 However, the GTI not only handles with sports car stiffness; it is also very comfortable. The electronic damper control of its new DCC system, in particular, produces an ideal synthesis of great comfort and excellent handling properties in the GTI. There are of course many sporty cars that are simply too stiff. Yet this one is always right. That must be stated very clearly." In fast curve driving, as soon as the innovative electronics detects that the wheel at the inside of the curve on the GTI's driven front axle is insufficiently loaded, the ESP hydraulics specifically builds up braking pressure at this wheel to restore optimal traction. So XDS acts as a type of transverse differential lock that compensates for the understeering that is typical on front-wheel drive vehicles when driving fast through curves. The results: Thanks to XDS, driving behavior is significantly more precise and neutral; drivers perceive this as more like the handling characteristics of a car with all-wheel drive than those of front-wheel drive. Hans-Joachim Stuck: "Beyond the GTI's already good chassis layout, XDS gives the car an enormous measure of driving stability. And it leads to greater driving enjoyment, since it reduces understeering. Experienced sports car drivers will be much more active underway. Yet, XDS is a very important safety feature for normal drivers too, because they will not experience any unpleasant surprises with the GTI. It simply would no longer press ahead." As an option, Volkswagen is offering the Golf GTI with completely redesigned bi-xenon headlights, including dynamic curve lighting. The headlights swivel through a steering radius of up to 13 degrees to the outside and seven degrees to the inside. The styling of the headlights closely matches the GTI's sporty character. The interior dual modules (xenon outboard, parking light / turn signals inboard) each have a chrome pod through which a very impressive visual image projects. Placed low below the bumper – and also GTI-specific in design – are the vertically aligned and always standard front fog lights.